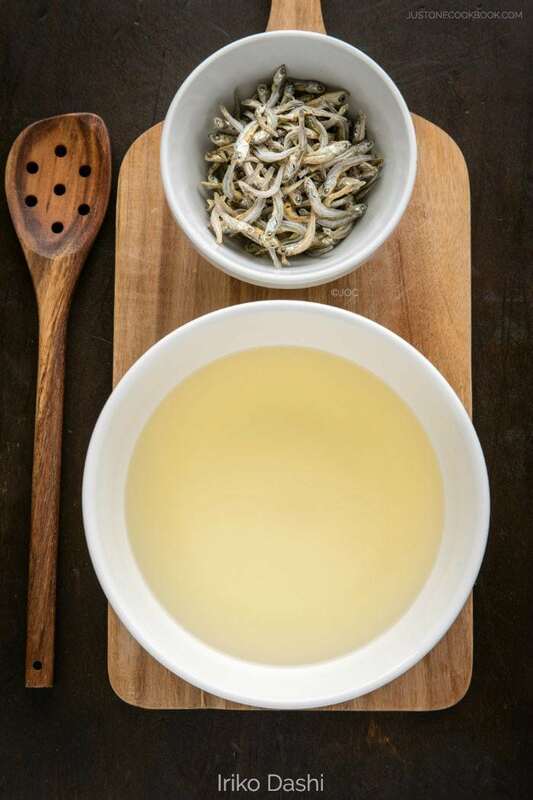 Learn how to make Japanese dashi stock at home with 3 simple methods today! Dashi (だし) is the basic stock used for Japanese cooking. My best guess is if you are not familiar with Japanese ingredient, when you see “dashi” in my ingredient lists and you might have thought to yourself, what’s dashi… can I skip it? Frankly speaking, if you try making Japanese food without dashi, it will not taste authentic. You cannot replace dashi with chicken or vegetable stock. If you skip it, the resulting dish will not reflect it’s true taste. We make dashi almost everyday and use it in many dishes. I usually make a big pot of dashi, and use some portions of it for my main or side dishes. The leftover dashi in the pot becomes the base for miso soup. 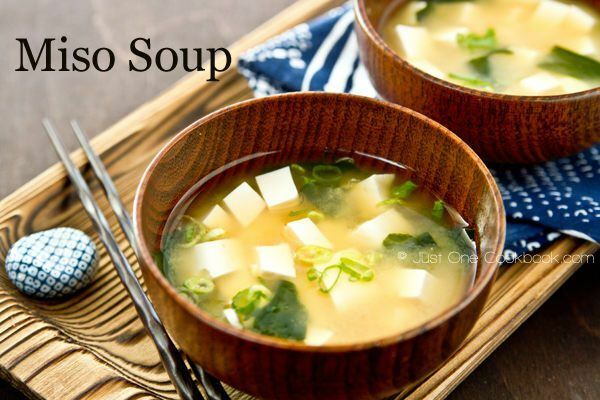 Japanese dishes are always served with a bowl of miso soup, so no dashi will end up going to waste. Before I start explaining the 3 methods to make dashi, please know that the Japanese have different types of dashi. 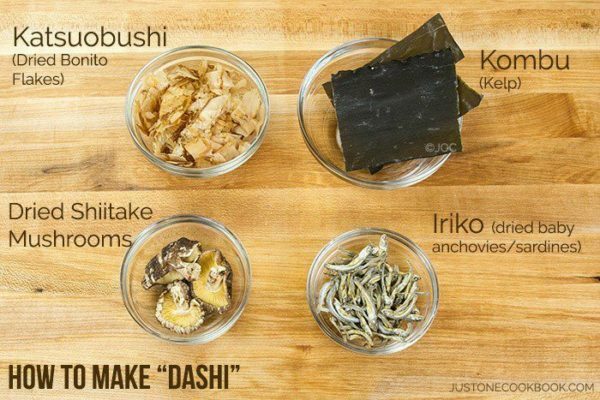 There are 4 types of dashi: Awase Dashi (most basic), Kombu Dashi (Vegetarian/Vegan), Iriko Dashi, and Shiitake Dashi. To learn about each dashi, please read more on this post. 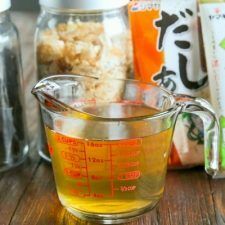 You can easily make dashi (Japanese stock) for Japanese dishes at home and I’ll show you 3 ways to make it. Today we’ll be making the most basic dashi, Awase Dashi, 3 ways. However, you can use the same approaches to make different types of dashi I’ve shared previously. 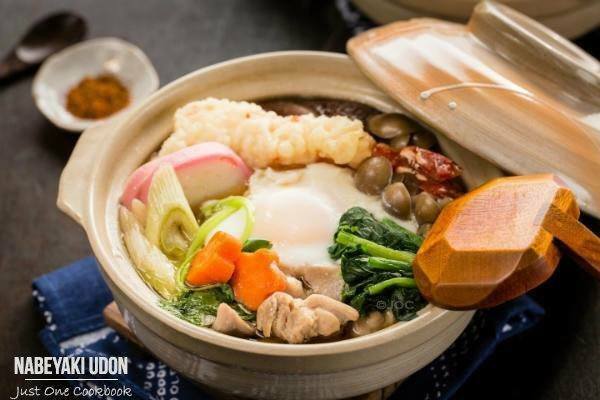 The three methods include dashi packet, which I use the most often in my daily cooking, dashi powder, if you’re in hurry, and lastly homemade dashi, the most delicious dashi you can make at home. Dashi packet is a little pouch that contains premixed ingredients to make dashi. 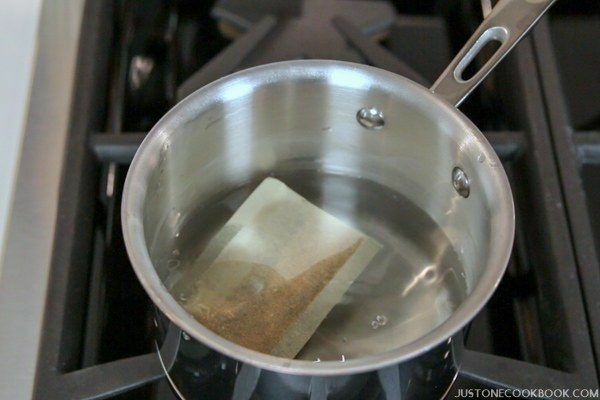 It’s convenient because you don’t have to prepare each ingredient yourself – everything in a tea-bag-like packet and all you need to do is to drop it in the water and boil. You don’t need to drain over a strainer and instead just pick up the packet and throw away after it releases all the flavors into the stock. This is a quick method, just like dashi powder, yet the taste is closer to homemade dashi because of the real ingredients in the dashi packet. The big Japanese grocery stores carry it but typical Asian grocery stores usually don’t. However, you can purchase it online from this store (ships internationally) or Amazon. 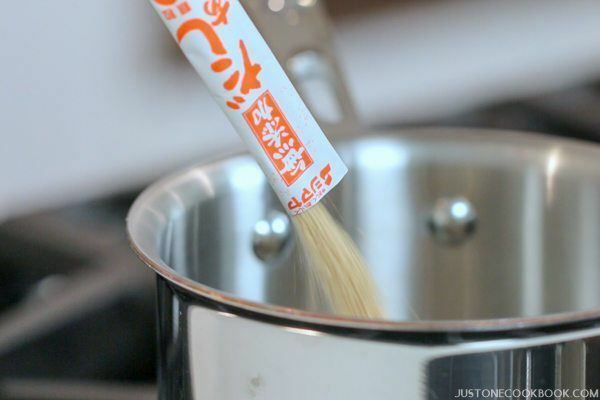 If you occasionally cook Japanese food and need dashi for Japanese cooking, many of you probably start with the powder method. It makes sense because dashi powder is relatively easily accessible in Asian grocery stores (and even in American supermarket) and available in many countries (Amazon also sells it). All you need is to sprinkle the dashi powder in the boiling water, and dashi is made! 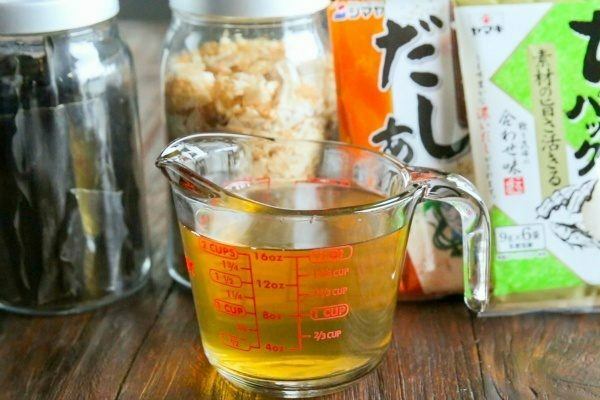 If you don’t cook Japanese food often, this is a great solution because you just need a box of dashi powder handy and don’t need to buy the several ingredients required for making dashi. Just like any other food, nothing beats the delicious homemade dish made from scratch. Same thing goes to homemade dashi. 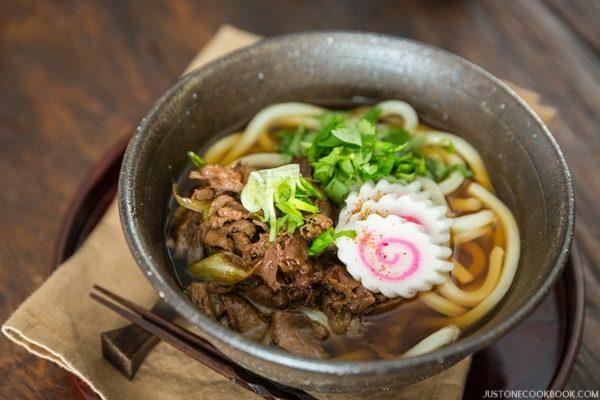 Compared to chicken/beef/vegetable broth, Japanese dashi is much easier and quicker to make. The methods are simple and you only need a few ingredients. If you’re new to dashi, it might sound very intimidating, but you can watch the video to see how easy it is to make them. 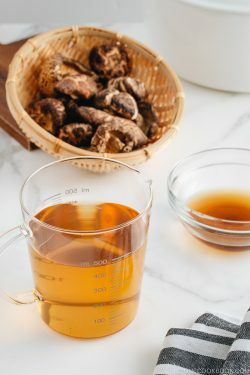 If you’re interested in specific dashi, please check out the following links for how to make Awase Dashi (with video), Kombu Dashi, Iriko Dashi (with video), and Shiitake Dashi (with video). 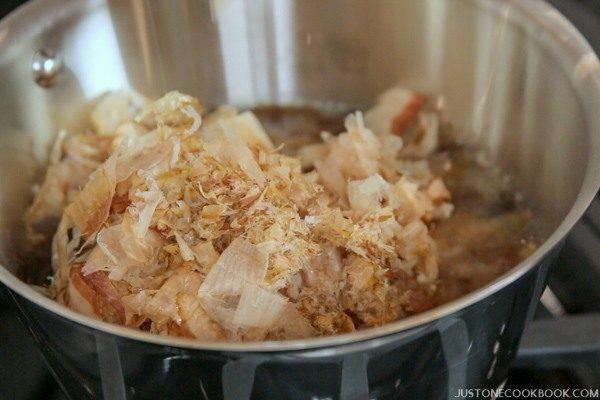 I hope you enjoy making dashi recipe! If you try it, don’t forget to share your picture on Instagram, Facebook, or Twitter with #JustOneCookbook. Thank you so much for reading, and till next time! Please check out the tutorial video here. Love your instructions. Thanks again. Thanks so much for checking, Theresa! Love your blog, you always keep the food so simple and easy to make, most importantly delicious! I guess we are all mothers, time is very precious, keep up the good work! Btw, love your kitchen, it’s so big and organized! I noticed one thing when I watched your video, your cooking pots are so clean!!! How do you do that? What are you using to make it so clean? If it’s not too much to share:) thanks! Hi Cindy! I apologize for my late response. I just found your comment in my inbox… Thank you for reading my blog and for your kind words about my kitchen! About my pots… there is no secret… I just wash it clean… hehee. Well, I clean it before putting into dish washer, but I always clean it very well. My mom has lots of pots that are not super clean… and she doesn’t use dish water and requires a lot of scrubbing to make it clean like mine. So maybe it’s dish washer doing the good job? Do you use a dish washer too? I’m a wimp when it comes to making dashi — I always use the powder. I really should grow up, shouldn’t I? 🙂 Really great post — thanks. 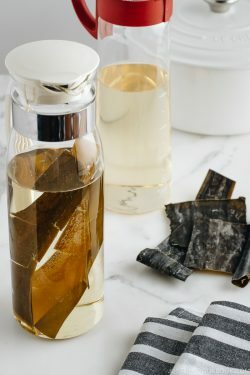 I have heard that you can re-use kombu several times. Is that true? I don’t think I have ever made shiitake dashi and since I love the taste of the mushrooms and their huge health-giving properties have to try! Interesting that one achieves a better result with dried shiitake – of course they dried are in the shops, but I so love the fresh ones easily available here – also hope to buy a seeded trunk next winter a try growing them myself . . . shall try this 🙂 ! Fantastic practical post, Nami! I know that some people mix up dashi and miso soup for example (and also miso soup and miso…). 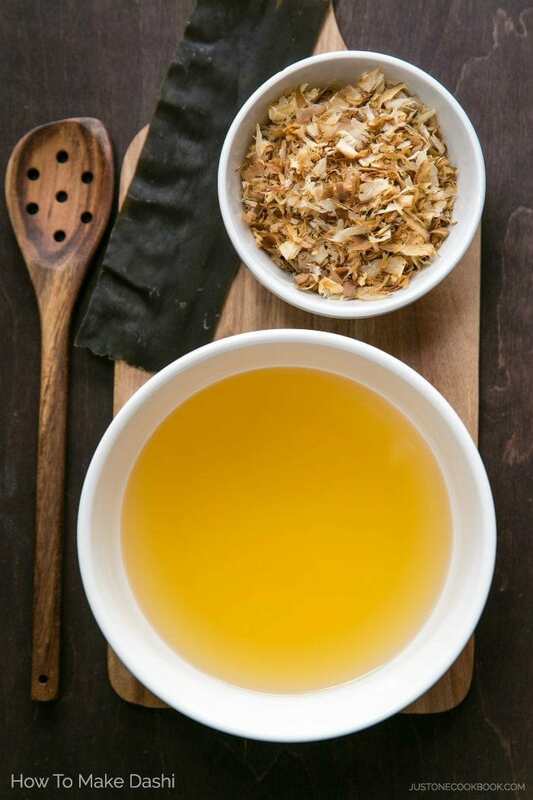 I have been making my own dashi for many years now (I started because the instant dashi is quite expensive here and then I found the dashi production so quick and easy compared to chicken stock I make non-stop…. I never looked back). I always make the katsuobushi + nori one and when I’m in a hurry and have no dashi in the fridge (making oyakodon for Sunday brunch for example) I use only katsuobushi and actually it works too. 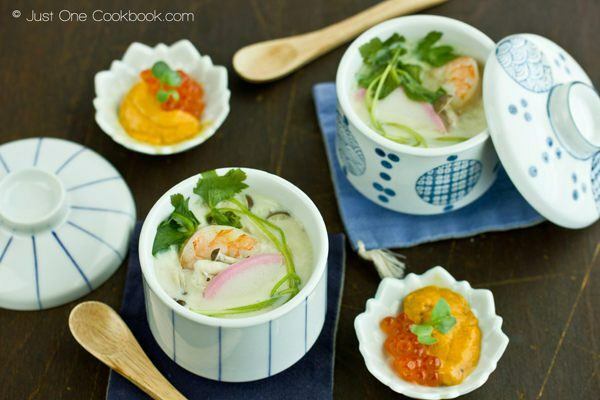 I’m not a fan of sardine stock (too strong) but I have never tried the mushroom one… I must try it one day. Thank you for reminding me! I must confess the only dish where I prefer to use chicken stock (always homemade) is chawan mushi. I followed Shizuo Tsuji’s advice (otherwise I wouldn’t have dared!) and find my chawan mushi more adapted to my tastebuds than the ones served in Japan (I guess because I always put some chicken inside it has an even more “chickeny” taste this way!). 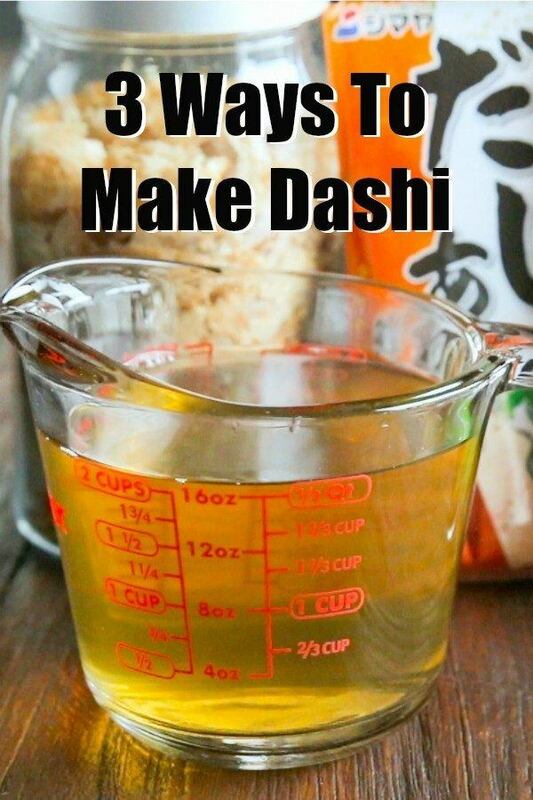 I just tried your homemade dashi last night, and it was so easy, fast, and tasty. The recipe I had used ginger but it also took much longer to make. One question I have; does kombu get old? I have some from my parents that are at least 10 years old…. 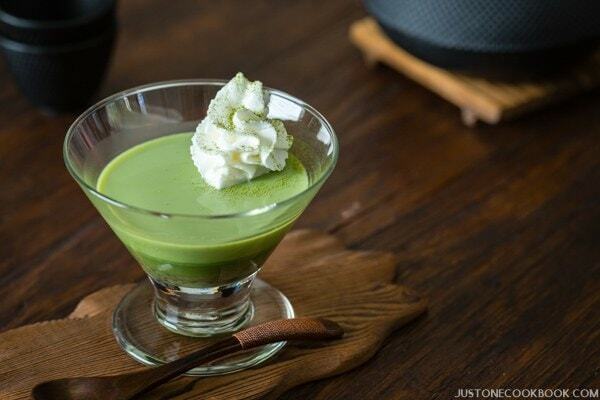 Thank you very much for the beautiful pictures, tutorial videos, and delicious recipes! Everything on your website reminds me of Japan and making your dishes brings a piece of Japan to me in Hawaii! I can’t express enough how much I love your website! Domo Arigato Gozaimasu! Hi RB! I’m so happy to hear you enjoy my recipes and videos! Thank you for your kind words and for writing! 🙂 Arigato~~! Hey! i just found your blog and everything today! and i totally love it! Can’t wait to try these recipes out!! Q: what happens to the left over Bonito flakes after you’ve strained them? do we just dispose of it, or can it be used for something else? Hi Shynell! I’m so happy to hear you found my blog! Welcome!! I hope you had a wonderful time in Japan. Which part of Japan were you living? Oh! I didn’t know there’s such a thing called dashi packets! I’ve always used dashi powder because I’m the only one in my family that cooks Japanese food and I only do it occasionally when time permits. I’ve never seen dashi packets sold here in my country but I’ll try searching in Meidi-ya, a huge Japanese supermarket here. Hopefully, I’ll be able to find it. I saw these dashi packets at Isetan and bought them! I have a question though. You boil one packet with 2-3 cups of water depending on what you are using it for right. Can you refrigerate or freeze the extra dashi if you don’t use all of it? If yes, for how long? 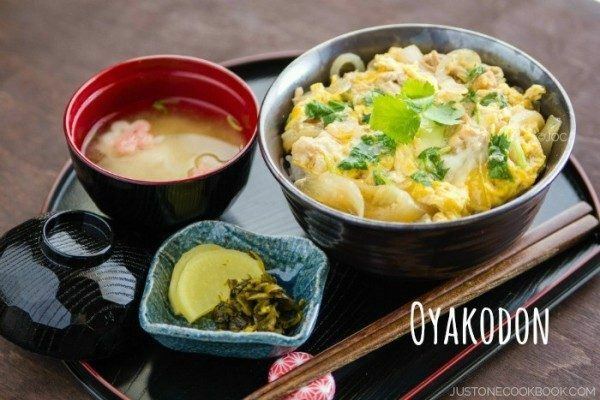 first of all, thank you for this awesome website, there’s so many easy and tasty recipe i was looking for to make some dishes i ate while in japan, and i’m glad i found this one ! Hi Andrea! In general you will need 1 tsp. of dashi for 2-3 cups of water. You can adjust the amount depends on your needs. Like for 1 cup, 1/2 tsp. etc. Thank you for the reply and the link, I didn’t see that page ! I’ll try with this quantity next time ! Hi Nami, I have tried using the Dashi packet, but its quite tasteless. Is it supposed to be like this? I was wondering if it is possible to use the dashi packet more than once, and perhaps have it steep longer on the second run? Thank you Leila! Depends on how quickly you take out from the first batch. IF just a few minutes for the first time, then sure, you can try for the second time. HOWEVER, use those dashi for some dishes that you’ll be seasoning more. For example, don’t use the 2nd dashi to a clear soup (with dashi) or Chawanmushi or something that relies on dashi flavor. Hope that helps! I use to make dashi with katsuobushi and kombu. When I asked my father how he made dashi, he told me the easiest way was to use shirodashi base (Yamaki Kappo Shirodashi). His comment was, “this is good enough.” And so it has been for me. Hi Michele! Yeah Yamaki makes good shirodashi and it’s convenient. We’re lucky we can get these in our Japanese grocery stores. It’s not as “pure” as homemade dashi though, to keep the dashi in a bottle for a long time. How long can you store the dashi (I did the powder option) in the refrigerator? The other day I tried making some dashi using the Ajinotmoto instant hondashi. I may have used a bit much of the granules, but it still tasted like stale water. After that I used the dashi (the liquid I made earlier – no idea if that was qualified as dashi or not) to cook some oyakodon following the recipe of justonecookbook.com. I had forgotten to add any sugar and I used tamari soy sauce instead of normal soy sauce. The food turned out pretty ok, but it still tasted a bit stale. I don’t know if I had messed up the dashi or it just tastes like that, I hope you could give me some advice on this. I just started learning japanese cooking. Hi Nami, can I use dashi powder to make cold soba dipping sauce? If yes,how to? Hi Rena! You can use dashi powder to make dashi (but unfortunately it will lack of flavor compared to making from fresh or dashi packet). I’m making pork belly ramen. The recipe calls for 1 litre of chicken stock + 100gm of white miso. 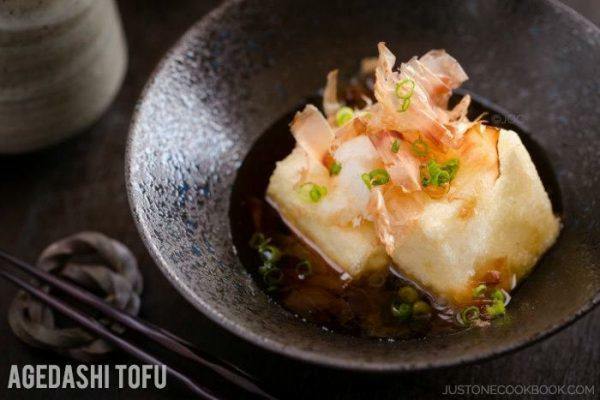 Can I make the dish using my Dashi (hondashi) granules instead of the chicken stock? I missed Japan. I remembered all this food. 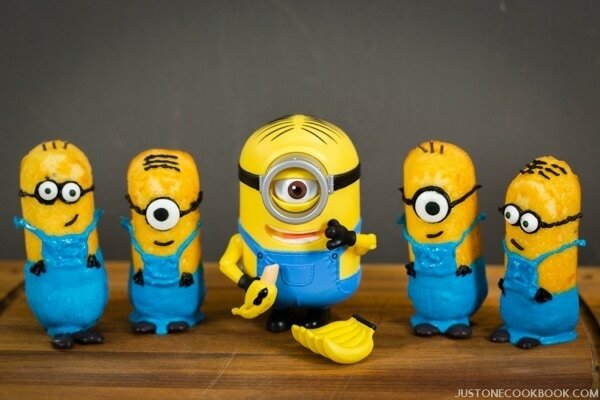 I really love it ! Hi is there any msg in dashi packets or powder? Thanks! Hi Joliza! Yes on most of dashi powder and dashi packet available outside of Japan. We do have MSG free dashi powder and packet in Japan but it’s hard to find oversea. It’s unfortunate! Thank you very much for your recipe. My sister kindly brought back the Dashi packets from Japan but everything was in Japanese. This helped a lot. Shaking the packet around in the water brought out much more flavor. Made your Yoshinoya beef bowl and it was delicious! Does kombu dashi taste like chicken broth? I really need a vegan chicken broth recipe. Thanks! I have not made this yet, but love your step by step instructions. Today we went to an Asian Grocer. We found the bonito flakes, but couldn’t find the Kombu. Instead we bought Nori sheets. That won’t work will it?